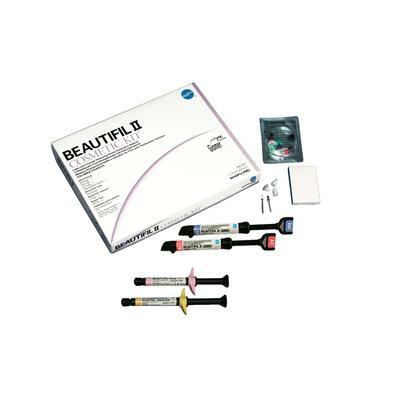 Beautifil® II is a universal nanohybrid composite incorporating S-PRG (surface pre-reacted glass ionomer) technology that contains a stable phase of glass-ionomer for esthetic and long-lasting restorations that release and recharge fluoride. Beautifil® II responds to the concentration of fluoride in the mouth while maintaining the strength and stability of a composite resin. High filler load and high flexural strength ensure long-term stability under rigorous intraoral conditions for anterior and posterior restorations, direct laminate veneers and core buildups.